When the temperatures drop, many pull out their trusty down coat to stay warm and cozy. Down is the layer of plush, insulating feathers found just beneath a bird’s outer, more waterproof feathers. Generally, down coats are more expensive than many other types of winter outerwear and feature a shell created from nylon. It’s possible to eliminate a grease stain from your pricey down coat without using harsh chemicals that could possibly permanently damage the nylon. Lay the down coat on a flat surface, making sure the stain is easily accessible and visible. Place the piece of paper towel under the stain to prevent bleeding. Cover the stain with a heavy coating of laundry pre-treatment stain remover. According to the University of Illinois Extension, (see reference 1) aerosol treatments penetrate the stain more effectively. Work the treatment into the stain with a plastic scrub brush or wash cloth. Allow the treatment to remain for at least one minute. Check the stain. If it’s beginning to fade, launder the coat according to the label’s instructions. The Mississippi State University Extension (see reference 3) also recommends washing the coat on the hottest water setting permitted according to the label. If the stain persists, pretreat with a combination of 1 tablespoon oxygen bleach and 1/2-gallon warm water. Dab the mixture onto the stain and allow it to penetrate for three to five minutes. Rinse the oxygen bleach from the down coat and launder according to the label directions. If the stain persists, pretreat it once again with the oxygen bleach mixture before attempting to launder again. If the stain is gone, dry the down coat according to the label’s directions. If the label reads “dry clean only” avoid pre-treating the stain. Instead, take the garment to a professional for cleaning. When possible, pre-treat a stain immediately so that it is less likely to set. Be sure to read the warnings on the pre-treatment product and always avoid getting any in your eyes. 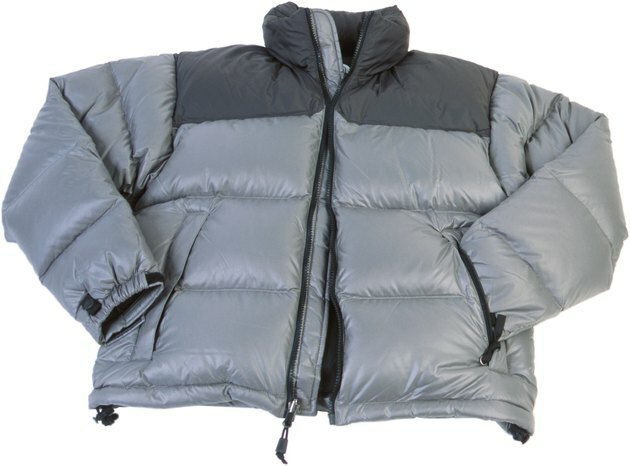 Can a Down Jacket Be Washed Instead of Dry Cleaned?